Brian will be presenting images and a lecture from his new book ICONIC: Perspectives on the Man-Made World at the Boston Society of Architects on Wednesday May 29th, 2013 from 6:00 – 8:00 pm. For more information please follow the link below. 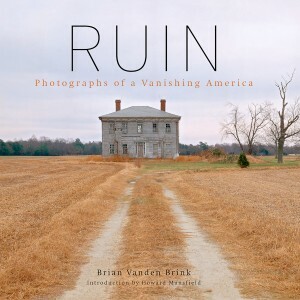 Brian will be presenting images from his book RUIN: Photographs of a Vanishing America on Thursday May 2nd 2013 at River Tree Arts, 35 Western Avenue in Kennebunk, Maine. Doors open at 6:30 pm. Please come, these are always fun and interesting events! 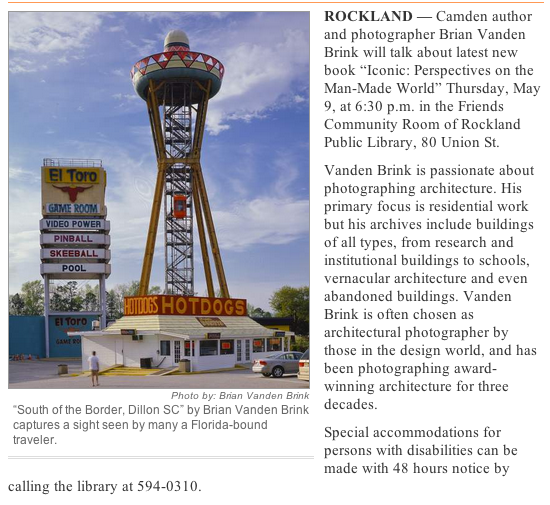 Brian will be presenting and speaking about his new book ICONIC: Perspectives on the Man-Made World at the Rockland Public Library on May 9th at 6:30 pm. The Village Soup posted an article about the event which you can see below. Please come!